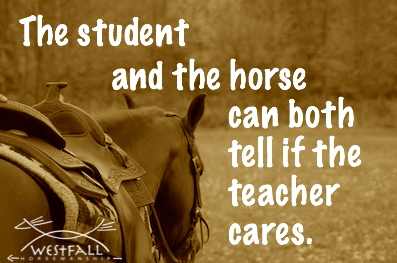 The student and the horse can both tell if the teacher cares. There is a ‘feeling’ that goes along with training a horse that is hard to put into words. Any teacher or trainer must possess basic knowledge of the subject but great teachers still care. A high school student can easily determine if a teacher knows their subject but teaches for the paycheck. The teacher may have loved teaching 20 years ago but that doesn’t matter to the student who is there today. Many teachers mechanically train students. Many people mechanically train horses. The student and the horse can both tell the difference. ← Itchy Foals vs Scratchy Trees…Cute! This is so true! I’ve seen it myself as a student looking at a teacher who had lost the joy of teaching, and I only realized the difference after I changed stables a found what a teacher who loves what they do is truly like!